Scar tissue forms as part of the skin's natural healing process from trauma such as burns or surgery. Many factors influence how your skin will scar, such as age, depth and size of the scar, heredity, gender and ethnicity. Scars from burn wounds are called "contracture scars," which cause the skin to tighten and can affect movement. This type of scar can also damage nerves and muscle tissue. Some scars may never fully go away, but most can be lessened, if not healed completely, with raw potato. 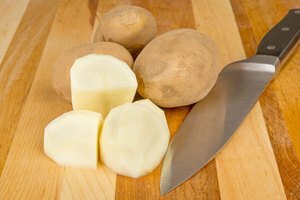 Raw potato contains potassium, sulfur, phosphorus and chlorine, all of which make it a good scar home remedy. Peel one or two raw potatoes, depending on how much scar tissue you are treating. Place the peelings in a bowl for later use. Rub the raw potato all over the affected areas, allowing the moisture from the potatoes to thoroughly sink into your skin. Bandage scars with potato peelings and leave on for at least one hour, or as long as possible. Repeat daily until scars heal, which should be in about two weeks. 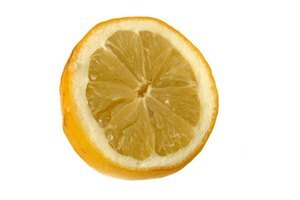 Raw potato also makes a good treatment for acne and acne scars. Simply rub peeled raw potato over the affected areas. Do not rinse.